Kyle and the other kids must solve every clue and figure out every secret puzzle to find the hidden escape route! John Denver and can still be seen almost every year during the holidays, usually on the Hallmark Channel. Chris also spent close to twenty years writing radio and television commercials for Burger King, Seven Up, Kentucky Fried Chicken, Dr Pepper, and many, many others. Grabenstein won the Anthony Award for best first mystery for his first adult mystery Tilt A Whirl. The other books in that mystery series have received all sorts of critical praise are called Mad Mouse, Whack A Mole, Hell Hole, Mind Scrambler and Rolling Thunder. In 2012 Chris collaborated with James Patterson on the book I Funny: A Middle School Story, which made The New York Time's Best Seller List. 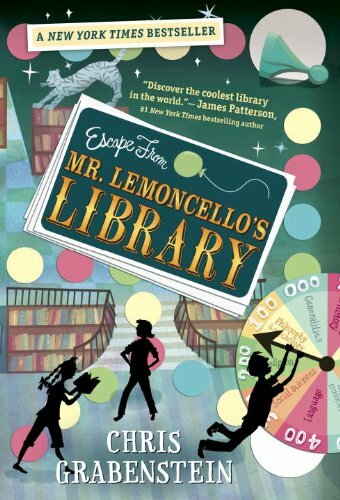 Chris is also the author of bestselling children's book Escape from Mr. Lemonchello's Library.